The Original Chopped Salad, made famous at Citizen Public House and also at The Gladly restaurant in Phoenix, AZ is easy to make at home! A unique blend of veggies- fresh and dried, sweet currants, salty pepitas and creamy dressing make this salad a hit with everyone. The Original Chopped Salad recipe is one you will make over and over again. 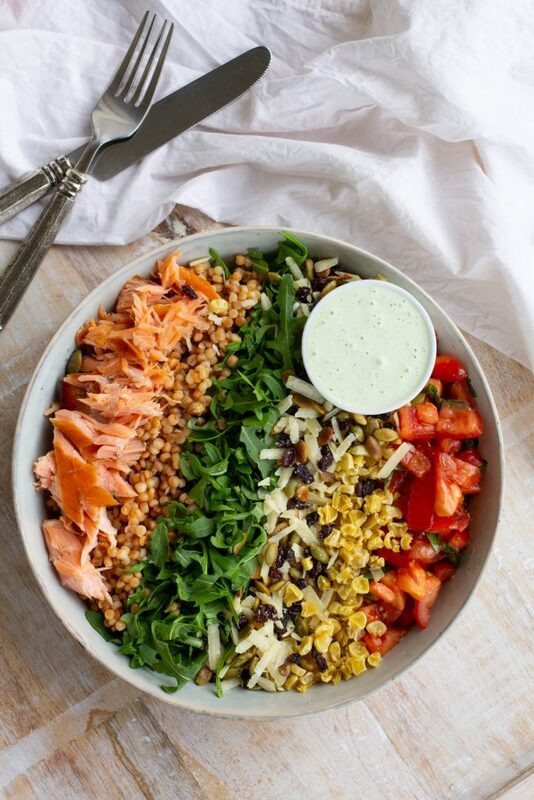 A few weeks ago, my daughter Brooke, aka Female Foodie , texted me and said “Mom you NEED to make this salad, it is one of the best salads I have ever eaten!” When your daughter (who has a food blog and eats out every day) says this is one of the best salads she has ever eaten, you know it has to be good! The Gladly restaurant in Phoenix, AZ features this salad as one of their signature dishes. The Phoenix Business Journal reported the salad was sold 75,000 times in one year. The Original Chopped Salad is also served at a sister restaurant to The Gladly; Citizen Public House (only open for dinner) in Scottsdale, AZ. There are many sources who report the (original) Original Chopped Salad was served at a Scottsdale establishment, Cowboy Ciao, (now closed). Tracing the origin of this salad is similar to tracing my family history! Anyhow, many identify this salad as the Arizona state salad. Do you know states not only have official flags, flowers and birds, but also SALAD?? I’m not sure this is official, but I do know Arizona residents love this salad! This salad is everything. yes, everything. And all the things. With thousands of salad recipes floating around online, what makes this salad so special?? 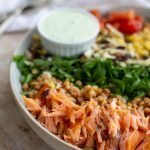 The perfect salad has just the right blend of textures, flavors, colors and the Original Chopped Salad includes ALL THE THINGS!! 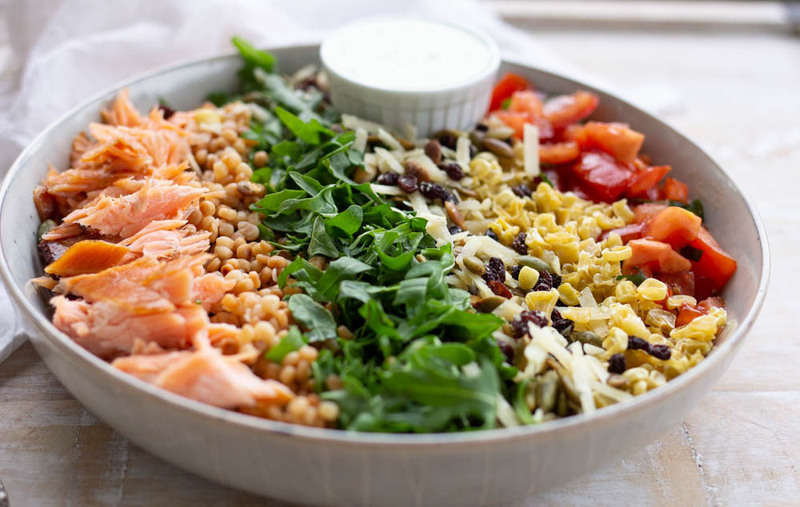 The recipe from the chef at the Gladly includes: smoked salmon, Israeli (pearl) couscous, fresh arugula, freeze dried corn, and a homemade “trail mix” that includes currants, pumpkin seeds, and Asiago cheese. The salad also celebrates tomatoes marinated in balsamic and olive oil. It’s almost too good to be true. All topped with a fresh cheese and herb dressing. The dressing by itself is worthy of post! This salad has multiple components, and the first time I made it, it took me a minute to wrap my head around all of the different ingredients. Mastering the making of the Original Chopped Salad is easy, it just takes a few steps. The first (and most time consuming) step is gathering the ingredients. Smoked salmon is found in most grocery stores. If you’re lucky enough to live on the west coast, you have easy access to freshly smoked salmon. Take advantage and buy from a local source! I found a good organic smoked salmon at Costco. If you aren’t a fan of fish, or smoked salmon, you could use chicken breast or bacon as a suitable substitute. 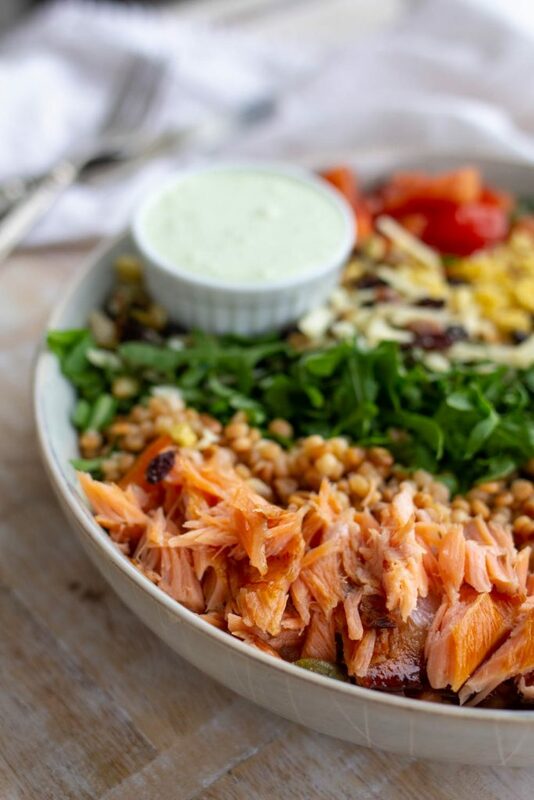 That said, I believe the smoked salmon gives this salad a unique flavor not to be missed! 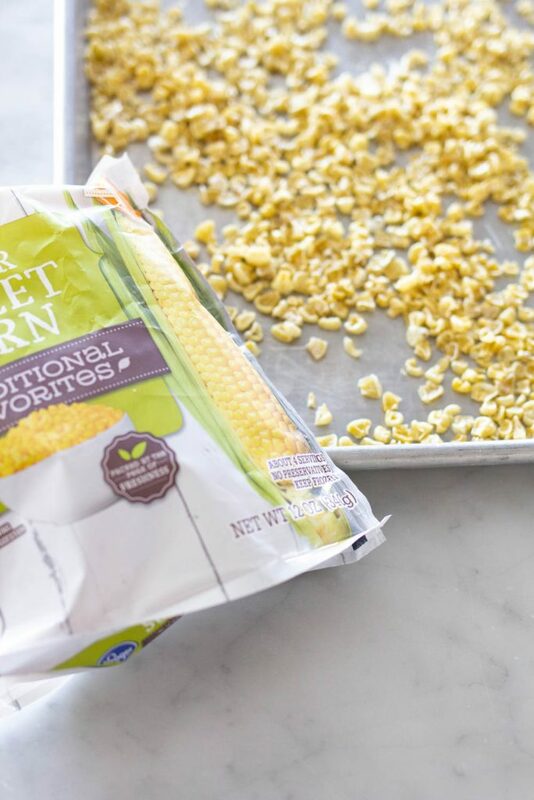 The freeze dried corn is a little tricky to find. I made several stops at grocery stores and finally found it at Whole Foods and Harmons (a local Utah grocery store). I wanted to make the salad before I found the freeze dried corn at a grocery store, so I opted to empty a bag of corn onto a jelly roll pan and turn the oven to the “dehydrator” setting, which means cooking low and slow at 135 degrees convection. I left the corn in the oven for about 6 hours. After 6 hours, it was crunchy and still sweet and a decent substitute for freeze dried corn. 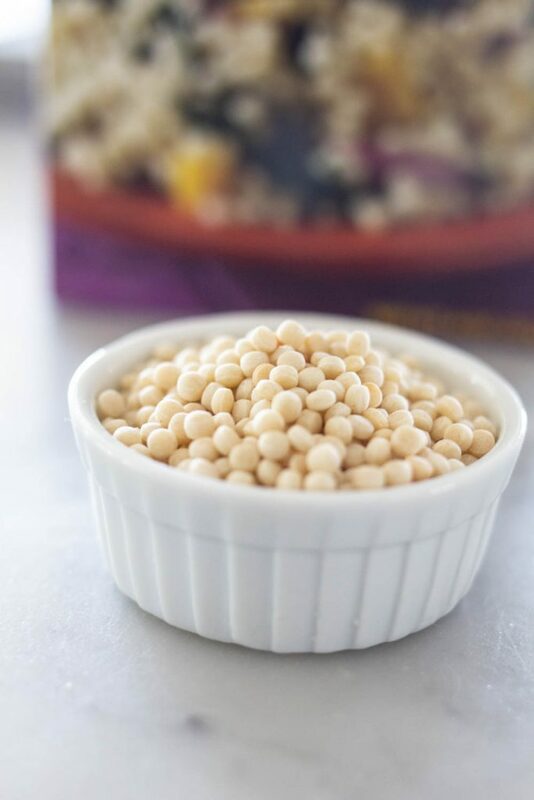 Making your own dried corn substitute at home is less expensive and less of a hassle to find than freeze dried corn, but not quite as pretty in the salad! This recipe for Original Chopped Salad serves one hungry person, two people with a baguette on the side, or 4 people as a side dish or side salad. When serving this salad, make sure to plate and serve with the dressing in a small container on the side. The salad may then be tossed with dressing. I’d love to hear your thoughts about the Original Chopped Salad in-restaurant or after making it at home! 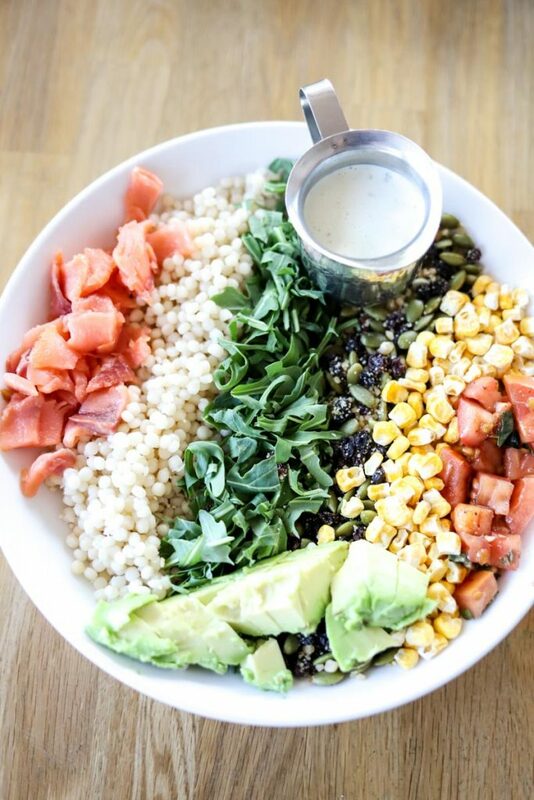 The Original Chopped Salad made famous at the Gladly resturant in Arizona is easy to make at home! This famous salad is a favorite to residents of the Phoenix and Scottsdale areas. Make the dressing and refrigerate. To make the dressing, combine mayo, buttermilk, cheese, juice of lemon, basil leaves and garlic in a blender. Pulse and blend on low until ingredients are mixed well. Add ground salt and pepper to taste. Cook the couscous according to package directions, you may skip the toasting of the couscous if you like the lighter appearance of the couscous. Refrigerate until ready to assemble salad. Chop the tomatoes and add balsamic, olive oil and a pinch of salt and pepper. Set aside. Wash and chop the arugula. Set aside. 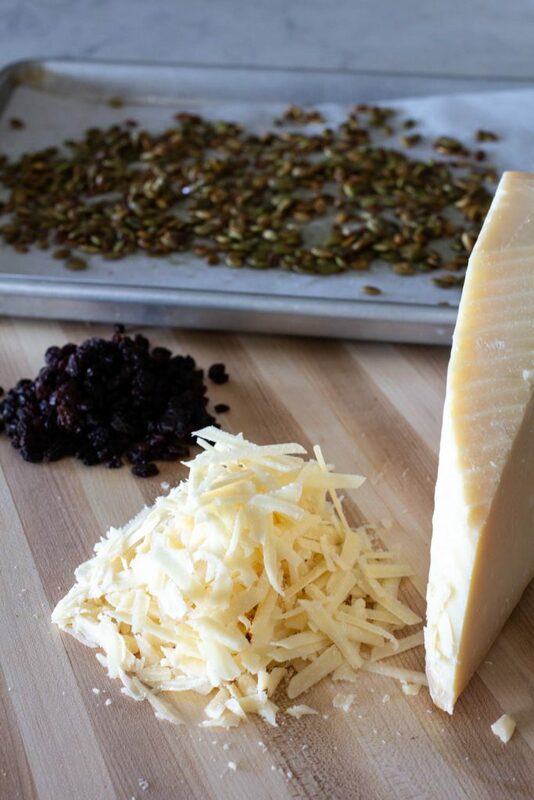 To make the trail mix, combine the currants, pumpkin seeds and Asiago cheese and set aside. Assemble the salad by placing the individual components in strips on a platter or in a shallow bowl as shown in photos. Serve with dressing and toss at table. Smoked Salmon. There are so many options. If you have the option to smoke salmon at home- do it! If not, buy from a reputable source. I like refrigerated smoked salmon rather than canned or varieties sold on a shelf. If you are not a fan or simply cannot locate or afford smoked salmon, chicken breast, cooked and chopped or bacon cooked and chopped will work as a substitute. The couscous is usually lightly browned on the stovetop in a little olive oil. I don't think it is necessary to brown the couscous. Follow package directions and cook the couscous in boiling water. You may use any type of tomato, but less juicy varieties are better to avoid too much liquid in the salad. Many grocery stores offer currants in bulk so you may purchase a smaller amount as opposed to buying a box in the baking section and only using a small portion. I use fresh grated Parmesan instead of purchasing Romano and Asiago cheese because I almost always have it on hand. Although the recipe calls for 2/3 of a cup of several ingredients, I use about 1 cup roughly measured. I am so happy to have a recipe for this salad that I can use over and over now! Great post! Thanks for sharing, Brookie! This is such an amazing salad and definitely a keeper. YESSSSS!! One of my all time favorite salads EVER!! As an Arizona native… I believe Cowboy Ciao was the first restaurant with this salad. I had it there years ago when they were still open. Wildflower Bread Co. has basically the same salad as well. The flavors and textures are spot on…I literally could eat this salad every day. Thanks for the recipe Si. I can’t find the explanation for the * listed in the recipe. Can you help? Hi Diane, all of the * explanations are listed in the recipe notes as bullet points. Hope this helps and thanks for asking! Ruth’s Chris Steakhouse serves a chopped salad with a light lemon dressing. I made the Internet recipe version for Super Bowl Sunday. I’m definitely going to make your recipe for Easter dinner. 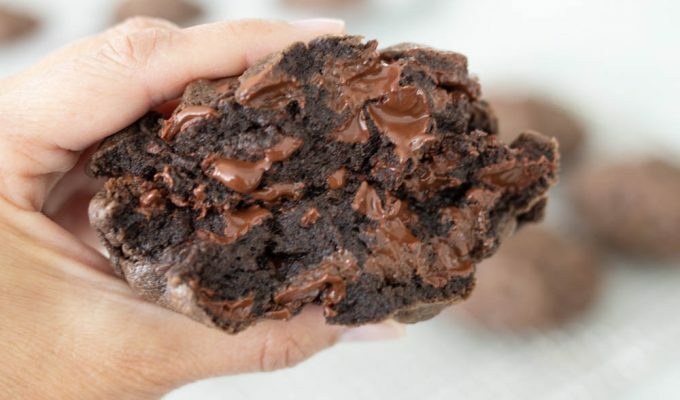 As always, your recipes are so easy to follow and so yummy! This salad would be perfect for Easter, Stefanie. Thanks for your comment and for reading ABK! 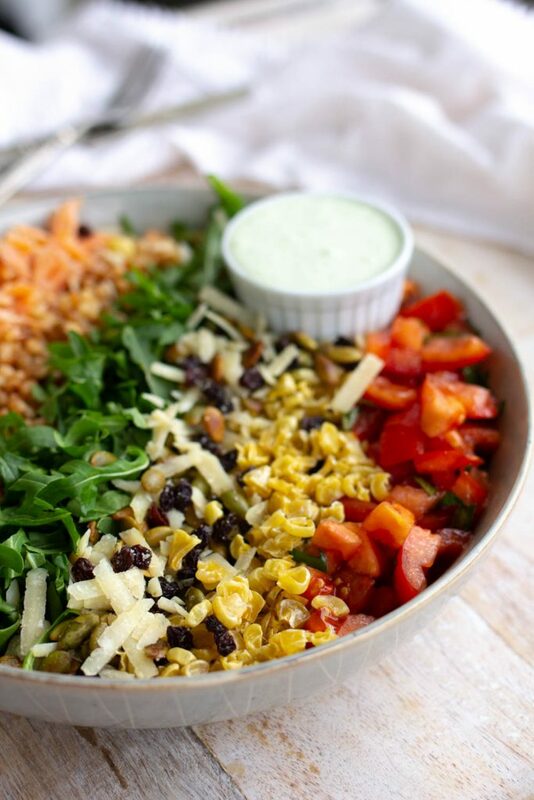 We have loved this salad for years… yes I think It originates from Cowboy Ciao. Sorry to hear they closed. We get the salad at Wildflower Bread Co whenever in AZ. I’ll have to try Gladly as well! I make this for parties often and smoke my salmon. I buy the freeze dried corn from amazon. Excited to try your dressing recipe! Hi Rebecca, this salad is definitely one of my new favorites too. There are so many yummy flavors, and smoked salmon would be so delicious in it. Thanks for sharing and for reading ABK! This is by far the best salad on the planet!! I did a blog post on my “attempted” version of this salad a few years ago, and yours looks even better!! I lived in Phoenix/Scottsdale for about 12.5 years and Cowboy Ciao was a favorite spot of mine! Thanks for this awesome post! This is the Best Salad!! We used to drive over to Scottsdale just to get it at Cowboy Ciao. So sad they closed. Thanks for the recipe! I’m excited to try it at home! I’m so glad you’re trying it, Anne. It’s definitely become one of our favorites. Thanks for sharing and for reading ABK!